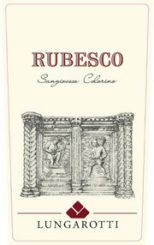 “Rubesco” is derived from the Latin verb “rubescere,” to blush, and has a joyous significance. Terroir: Grapes are cultivated in clayey‐sandy soil with medium depth, good structure and limestone subsoil. Vinification: Stainless steel fermentation with 15 days of skin contact followed by aging for 12 months in casks and 12 months in bottle after light filtration. Bouquet: Delicate and with good intensity, elegant complexity with hints of pepper, cinnamon and tobacco; background notes of red jam and violet. Flavor: Solid structure and superb concentration, it evolves with fresh acidity; austere, balanced tannins with a fruity and slightly mineral finish.